Waccamaw Sports Classic, Conway, SC: “Rich Skovran, Rich Brown, Frank Nicolio and Jim Connery headed to Coastal Carolina University to get the courts layed out and ready for the 4th Annual Waccamaw Senior Classics on April 20th. Approximately 25 players from Myrtle Beach and North Myrtle Beach participated in Pickleball. The Sports Classic is for adults age 55 and older who compete in various categories including basketball, track and field, spin casting etc. in addition to pickleball. It was a big day for seniors. JoAnn Williams & Audrey Connery did an outstanding job keeping the courts moving, and Bill McElyea volunteered to take all the pictures. He has saved the day many times with his computer and his camera. A BIG Thanks to all these wonderful people for their time and energy. It was a fun day! The Choose to Lose program ended with a bang! Rich (Skovran) ended up introducing about 55 new players to pickleball. Tuesdays and Thursdays were designated for beginners; Mondays, Wednesdays and Fridays for the more experienced players. Many left saying they were going to find a place to play in their home state or were going to start something new in their area. Rich provided help to get things started and also gave new players a list of “Things you should Know about Beginning Pickleball." On March 22, there was a Round Robin for any new player that wanted to sign up and a luncheon followed. It was a huge success. The Most Improved Player Award went to Irene Mertly from Michigan. T shirts were also given away. A fun time was had by all. 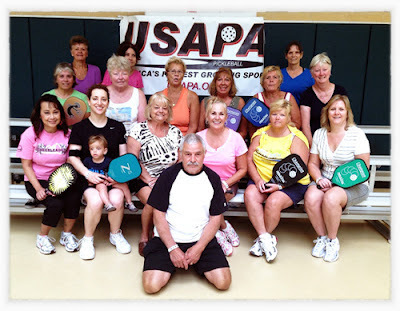 For International Pickleball Week We started off with a Women’s Round Robin and luncheon on April 17th. The women always have a good time and we held a drawing for some give-a ways. The food was great as always. We have a super bunch of women who always come together to spread some joy at the table and on the court. 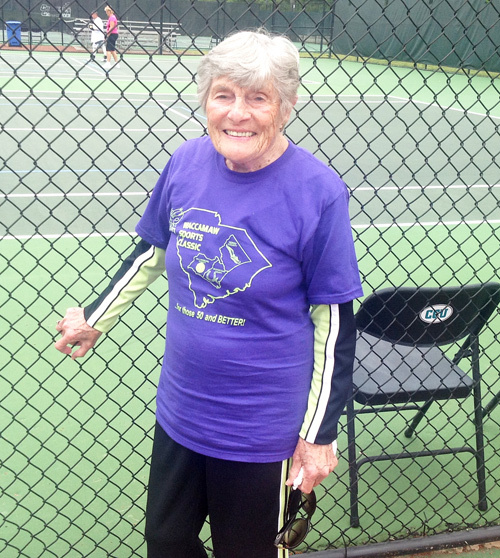 On April 18, Ambassadors Rich Skovran, Ambassador, Rena Grant (pictured) and friend Frank Nicolio went to Burgess Elementary to teach 50 students how to play pickleball. This was quite unique in that the teacher loves to teach her students sports that they can continue to pursue in their later years. 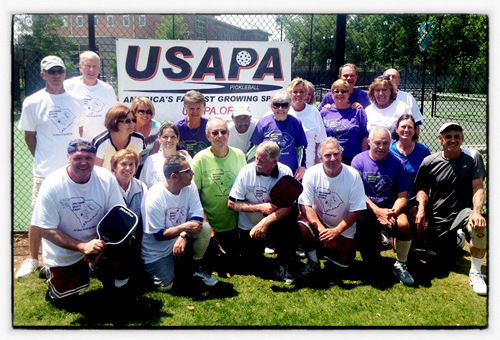 Everyone had a great time and it is very likely that pickleball will be on their agenda in the future. Rena! Great to see that you've recovered and are back on the courts enjoying the game! 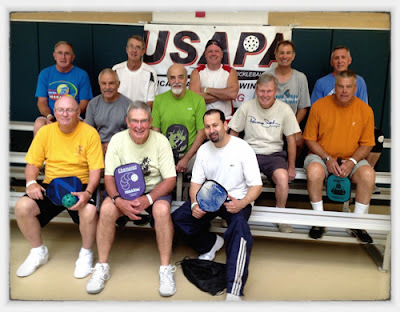 On April 19 Rich held a men's Round Robin at Pepper Geddings in honor of Pickleball week. These men were some of the best. They played hard for almost 3 hours. They loved it! Following the games the guys enjoyed some ham sandwiches, potato and macaroni salads and fruit! Some shirts were given away as well as some water bottles. A good time was had by all. Pepper Geddings is in full swing and they are getting a new floor in the 2nd gym. This new floor should be done by June. We will have 2 new pickleball courts in this gym for a total of 5 indoor and 2 outdoor courts. It’s a great time in Myrtle Beach! Rich Skovran will be working with the Pepper Geddings Recreation Center who will be sponsoring a non-sanctioned tournament on December 13-14-15, As soon as the entry form is ready we will post that along with all the other information you will need to get ready to play! Rich would like to thank all the volunteers and pickleball players for their support of the game and for the support given to him as the ambassador. We have a great bunch of players who help one another and they all deserve great big THANKS!